The red rocks of Moab are alive with the sounds of Middle Eastern drums, dancing, zils and zagarheets. It’s all because of one amazing, energetic and creative woman, Jamilla. The fourth annual Tribal Sands, Belly Dance and Drum Festival runs September 19-23, in Moab, and it is rapidly becoming the belly dancing event of the summer! This year’s performers include Kami Liddle, Anita of Fat Chance, Amy Sigel of Unmata, Fvorboda of Dragomi, and music from What It Is from Texas and Azul Salvaje from Canada. “I want Tribal Sands to be more than just performances and workshops. I want it to be an opportunity for dancers to get together and talk, laugh and relax. A retreat. I want it to be a retreat where everyone has fun,” Jamilla says. The granddaughter of a Spanish Basque gypsy, Jamilla’s love of organic dance comes naturally and genetically. Originally trained in classical ballet, she was hooked on Middle Eastern dance after watching her sister belly dance. Jamilla moved to San Francisco to learn from her sister who had studied under Jamila Salimpour. Soon after, she saw Fat Chance and took several intensive workshops from Caroleena Nerricchio. While going to school and living in Logan in 1997, she started a troupe called Mountain Veils. Jamilla moved to Moab and started Desert Veils in 1999. Today they are a very successful and popular dance troupe throughout Utah and Colorado. Jamilla is the director, choreographer, costume designer and seamstress of Desert Veils. 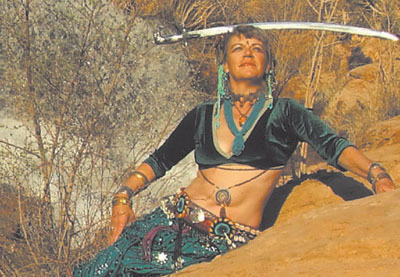 “I started Desert Veils in 1999, and I still have my original members, like Jana Wilson. You know who is going to take their dancing seriously, because when you are dancing at this level, you have to be serious. I teach two classes a week, and I have mothers, daughters and grandmothers all together as students,” she says. Jamilla is truly a child of nature. She responds instinctively to the natural forms and energy of the desert, where she creates most of her choreography. She is inspired and creatively energized by the landscape around Moab. It isn’t unusual to see her dancing amongst the red rocks at sunset. “Some of us don’t write or sing, but through our bodies we can tell the truth of our lives. Belly dancing is a way to tell our stories and the stories of our ancestors. Even if you are in a troupe with 20 other women, you can still tell your own story. Every undulation, every body wave is a new page to pass on to daughters and granddaughters. I want to make people think and feel. I want them to feel the ancient sisters dancing through us. I want my audience to know that we are all in this together,” she says. Find out more about Desert Veils and Jamilla at www.desertveils.org. For information regarding Tribal Sands, visit http://www.desertveils. org/2008festival.htm.